Students from St Nicholas and Holy Cross schools range between 9 and 16 years of age. Teachers want to teach them about Lent and help them build friendships. Older kids prepare intentions to explain the Passion and Calvary of Christ to younger pupils. 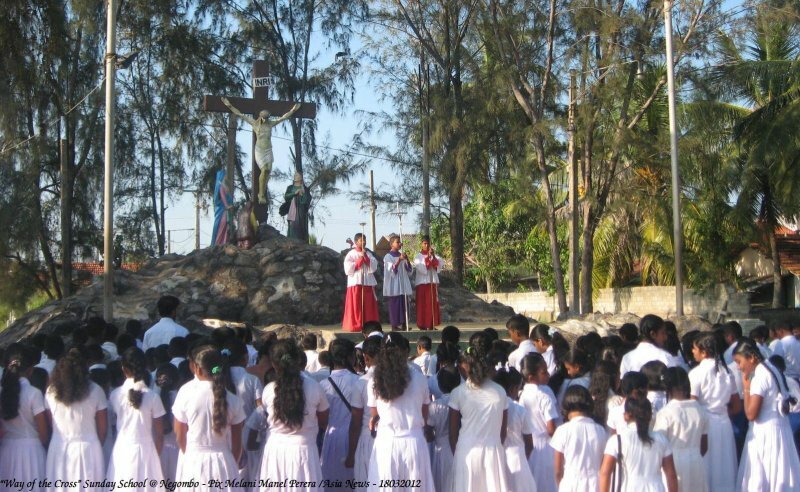 Negombo (AsiaNews) - Aged between 9 and 16, more than a thousand uniformed students from St Nicholas in Munnakkaraya and Holy Cross in Siriwardhana Place took part in a Via Crucis yesterday. The procession, which started at 7 am and lasted three hours, saw the students mark Lent and bear witness to Jesus' Calvary at the 14 Stations of the Cross erected on the grounds of Holy Cross Church. Teachers from the two schools organise the event each year. "We have two goals," teachers explained. We want to "teach the children about Lent and build unity and harmony among kids from two different villages." We also want to "give them an opportunity to meet and work together." The older students prepared intentions to read at each station of the Cross during the procession. "Walking along this path encourages us to think about our sins," Dilshani Padmini, from St Nicholas, told AsiaNews. "It also gives us strength to change our lives." For another student, Anton Roshen, "this procession is important for the younger generations. The smaller children do not know Jesus that well or why he was crucified. Each year, we show them what Lent and Easter are since the Way of the Cross helps change our life, making it better."